The team brainstorming session is a common way for drumming up new ideas but research suggests that they have one big problem: Group interactions, like brainstorming, can actually inhibit idea generation. APS Fellow Paul B. Paulus of the University of Texas at Arlington has studied creativity in groups, and his research suggests that brainstorming doesn’t actually work as well as people might think. But this doesn’t mean that bringing team members together to come up with new ideas is necessarily useless. 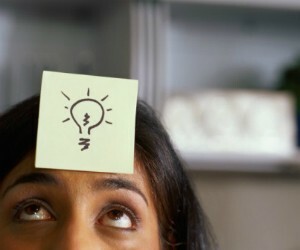 Paulus and colleagues have found that a few tweaks may boost the effectiveness of brainstorming. One technique that the Paulus and colleagues are investigating is “brainwriting,” where team members share ideas through writing them down instead of shouting them out loud. Few evidence-based studies have investigated effective brainstorming, so Paulus and colleagues designed two small exploratory experiments to put brainwriting to the test in a real office setting. Participants were employees at a global technology company that was looking for ways to improve productivity after hiring more staff. In the first study, 57 employees were asked to come up with ideas about how to make an excellent, significant, and effective team. In one condition (alone-to-group), participants wrote down ideas on slips of paper individually first, followed by a group brainwriting session. After 10 minutes of writing ideas down individually, participants were asked to start passing their slips of paper around to the group as they continued to come up with ideas. In the other condition (group-to-alone), this order was reversed. People generated 37% more ideas when they worked as a group first, compared to when they worked alone first. In a second study, Paulus and colleagues tested out a technique called asynchronous brainwriting, in which individuals quickly alternate between sharing with a group and working alone. The researchers hypothesized that this technique would allow for the best of both worlds, ultimately leading to more ideas than a straightforward group sharing session. The same group of employees were assigned to either a group condition as in the first study, or an asynchronous condition. In the asynchronous condition participants alternated between writing ideas individually for 8 minutes followed by brief 3-minute review sessions in which they passed around and read their team members’ ideas. The asynchronous condition yielded more ideas than did the group condition. An analysis of the rate of ideas generated per person per minute during the idea generation sessions showed that the rate of idea generation was significantly higher in asynchronous condition (a 71% advantage). “Both studies demonstrate the benefits of exchanging ideas by brainwriting. This paper thus suggests that brainwriting may be an effective approach in industrial or organizational settings when there is interest in generating a large number of new ideas,” the researchers conclude. Interesting research. However, it seems only to have reviewed the quantity of ideas generated rather than the quality of those ideas. Assuming the final aim of brainstorming, brainwriting, etc is to provide a creative solution to a problem, then a fewer number of higher quality ideas should be preferable to a smaller number (or even just one) high quality ideas. It would be interesting to follow up on this research and test for originality as well as quality. Hi, not a psychologist, but, many claim the more ideas the better. “The best way to have a good idea is to have a lot of ideas.”- Dr. Linus Pauling.